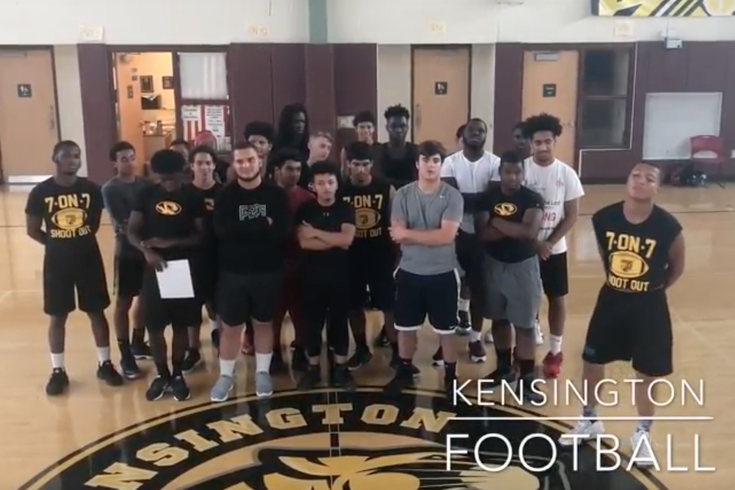 Kensington High School needed to raise money to replace all of the football equipment it had stolen from the team's shed this summer in order to save the team's 2018-19 season. Justin Young’s Facebook inbox lit up on July 21. A neighbor of his in Kensington had seen a man walking from the Kensington High School football shed, just off Front Street by the Berks Station Market-Frankford Line stop. The man had been carrying team equipment earlier in the day, and she didn’t think much of it at the time, but she saw the same man carrying more equipment a few hours later so she messaged Young, an assistant football coach for Kensington. Young said his friend was concerned the high school's team had been robbed. Young and another coach took a ride in his car to the team's field, opened the latch to the football equipment shed, and revealed his worst fear. Every set of shoulder pads and every helmet was gone. The pads from the team’s football sleds had been removed, placed next to each other, and covered with a sheet as a makeshift bed. That "bed" was splattered with blood, Young said, and needles were scattered around the shed’s floor. Everything the team owned, Young said, had been rummaged through. “It’s all gone,” Young told PhillyVoice over the phone on Tuesday, 11 days before the team’s first scrimmage, one of its two preseason games required by the PIAA before the regular season opener at New Hope-Solebury on Aug. 24. Young was using Tuesday, his day off from his day job as a fire restoration technician, to mow lawns around his neighborhood, trying to make up the sizable gulf between what his team needs and what it currently has. The team started a fundraiser with a goal of $4,000, which Young admits is substantially lower than it needs to be to outfit the 64-player team. But they have to start somewhere. Just a week earlier, Young had organized a 'Beef & Beer' night for friends and family of the team and managed to raise $1,600 for final costs ahead of the season. Young said the team was upset when the kids heard the news, but they also weren’t surprised. Living in Kensington, a flash point in Philadelphia’s ongoing battle with an opioid epidemic, isn’t easy, he said. If you’d like to donate to the team’s fundraising efforts, you can use this link.